Beautiful RARE specimen stock certificate from the Home Shopping Network, Inc. printed in 1990. This historic document was printed by the United States Banknote Corporation and has an ornate border around it with a vignette of the company logo. This item has the printed signatures of the Company's Chairman of the Board, Roy Speer and Secretary, and is over 23 years old. The forerunner of HSN was launched by Lowell 'Bud' Paxson and Roy Speer in 1982 as the Home Shopping Club, a local cable channel seen on Vision Cable and Group W Cable in Pinellas County, Florida. It expanded into the first national shopping network three years later on July 1, 1985, changing its name to the Home Shopping Network, and pioneering the concept of a televised sales pitch for consumer goods and services. Its competitor QVC was launched the following year. The idea for HSN had its roots in a radio station managed by Paxson. In 1977, due to an advertiser's liquidity problem, the company was paid in can openers. Left with having to raise the funds, on-air personality Bob Circosta went on the radio and sold the can openers for $9.95 each. The can openers sold out, and an industry was born. Circosta later became the new network's first ever home shopping host and would eventually sell 75,000 different products in over 20,000 hours of live television. In 1986, HSN began a second network that broadcast over-the-air on a number of television stations it had acquired under the name Silver King Broadcasting. In 1999, the stations were sold to IAC founder Barry Diller and changed its name to USA Broadcasting, with a few of them ending HSN programming outside of overnight hours and taking on a local programming format equivalent to Toronto's Citytv. In 2001, the stations were sold again, this time to Univision Communications, the stations later became charter stations of Telefutura when that network launched in 2002; however, HSN continues to air on low-power stations (one of these is owned in agreement by Univision). Ventana Television (ventana meaning window in Spanish) has the same street address as HSN, and is the holding company for its broadcast licenses. 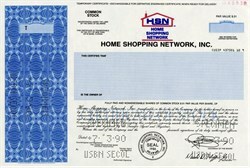 In 1999, the company launched HSN.com, which as of 2009 is one of the 10 most trafficked e-commerce websites. In 2008, HSN also started MySpace and Facebook pages. In an attempt to engage with younger consumers in 2009, HSN produced a 14-episode online video series, Faces of Beautiful You, which follows three young women who find solutions to many of life's problems through HSN's beauty products. The campaign included a Facebook widget, character blogs, and profiles for the three main characters on Twitter, MySpace, and Facebook. On August 19, 2012, HSN co-founder Roy Speer died after a long illness. have a serial number, or they have a serial number of 00000. This is an exciting sector of the hobby that has grown in popularity over the past several years.